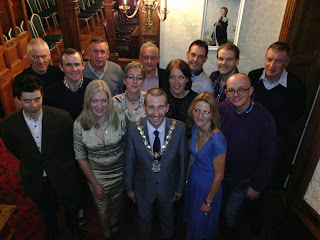 I hosted North Down Cycling Club at The Castle, Town Hall, Bangor on Friday 24 January 2014. Medal winners and Committee members were present for the formal reception recognising the positive contribution North Down Cycling Club has made to date. I welcomed the club to the Mayor’s Parlour as Mayor and Honorary Member of the Club and then provided a tour of the historic Town Hall. As the largest Cycling Club in Northern Ireland, North Down Cycling Club should be rightly proud of their achievements to date with many awards clinched and all abilities catered for via a range of cycle rides which take place every week throughout the year. All present, including myself, spoke about the forthcoming Giro D'Italia and eagerness to enjoy this cycling spectacle at the event specially organised by North Down Cycling Club. I look forward to supporting the Giro D'Italia and North Down Cycling Club in my club colours later this year. In the meantime I will continue my work to create a Bicycle friendly Borough as Mayor, Councillor, Cycling Club member and Sustrans Ranger, facilitating safe sustainable travel by bicycle through a range of initiatives, whether it be Coastal Path upgrade, Cycle Hire, Road Safety improvements or Bike Week initiatives.